Most of the choices that people make in life naturally involve some element of risk. Avoiding risks altogether can limit life opportunities, and impact negatively on quality of life. People want choice and control for themselves and safety for those they care for. This is because risk is a concept that tends to have negative connotations, but people take considered risks all the time and gain many positive benefits. People perceive risk differently, including people who use services, practitioners, and families. This can be difficult for social care practitioners and confusing for individuals and families. 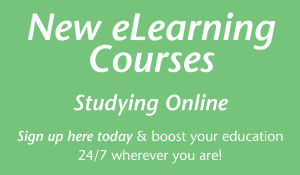 Therefore, adopting a balanced approach at a practice level can be a challenge. Balance and proportionality are vital considerations in encouraging responsible decision making. What skills do staff need to properly develop positive risk taking in their practice? How can learning programmes be developed that inspire and motivate practitioners to take a bold approach to positive risk taking? What systems need to be in place to enable a responsive approach to positive risk taking? Getting out of bed, and all that it entails – getting washed, dressed having breakfast, and taking the bus to work – carries risk. Though, staying in bed could still involve both psychological and physical risks. Back in the mid 80’s the social care sector often ignored risk assessments. There were risk assessments in place for health and safety of the building and staff. However, what was lacking was person centred risk assessments to support the people using our services to positively live their lives. I recall us supporting extremely complex individuals to go to Glastonbury music festival. We did this without a risk assessment, and this was back in the day when you could speak to Martin Eavis directly to get free tickets. They were the days of ‘try it and see’. By the late 80’s risk assessments were firmly and quite rightly in place to ensure staff were confident to support people to try new things, and live as full as life as possible. Managers who would start a sentence ‘Yeah, let’s try that, let’s do a risk assessment’ with a smile. It was as if doing the risk assessment itself was the incentive to make it happen. Over time, I noticed that the sentiment of risk assessment changed. The managers started to say, ‘oh no, you had better risk assess that’. It seemed like the idea that risk assessment had become a way of limiting people. The intention changed. Risk assessment should be used as a tool to support empowerment, and innovation. It should also be used to listen to those that need care and support. Finding time to embark on meaningful co-production, ensuring the person is an equal partner in the shaping of their services is likely to mean that people will be faced with more choice. Where people are faced with more choice this is likely to lead to options that introduce more risk. 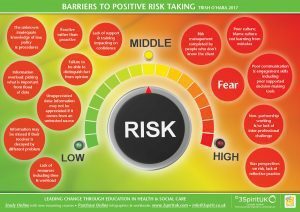 So what is stopping our services effectively undertaking positive risk assessments, what are the barriers? People perceive risk differently. For instance, it you ask nurses what is the main risk for older people in care homes, they are most likely to say, falls. If you ask social workers, they are likely to be concerned with risks to adequate housing or benefits. If you ask their family, it is likely to be that they are concerned that their loved one is treated badly. If you ask the person themselves, they may be more concerned with losing their identity and/or purpose. We come to the table with a bias based on role and relationship. Getting the balance right requires professional competence, partnership working and understanding that safeguarding is about improving quality of life as much as safety, and can only really work if we keep it personal. Because risk assessment is considered a skilled endeavour, we often see managers or team leaders completing the risk assessment from beginning to end from inside of an office, rather than inside the life of the person. Key-workers need to be trained to understand risk assessment and be part of the process, as they are often the people who know the person best. There is also a real fear of being accused of neglect. Staff also struggle to understand that what may be important FOR the person may be in direct conflict with what is important TO them. A disproportionate response that infringes the rights of individuals to make their own, albeit at times, unwise decisions. Often there is a lack of a working knowledge of the Mental Capacity Act and what it means to deprive a person of their liberty. A general lack of knowledge when and where to apply the law. Ultimately, risk is part of life and arguably the most successful people take many of them. It is impossible to self actualise without taking risks. It’s the only way to face the challenge of Everest. Many of us would make it to the top if we were given the chance to do it at our own pace (maybe years), using our own methods, with the right people and with the adaptations required to help us along the way. We would find our own peak and reflect on our own troughs knowing where we are, where we have been and where we are going. We will continue to challenge practice in our work streams, and get practitioners to really believe that positive risk taking is a fundamental core of practice. 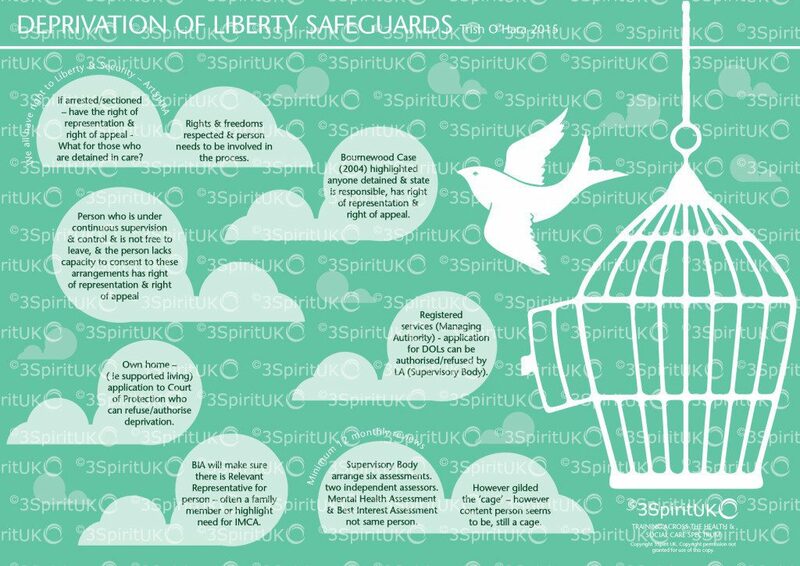 Deprivation of Liberty – Are we spending public monies wisely? I for one, am fully aware of the necessity of adhering to Article 5 of the ECHR and delighted that Lady Hale pointed out that however golden the cage, it is still a cage. State imputability: i.e. that the deprivation of liberty can be said to be one for which the State is responsible. seems to have created an unprecedented amount of paperwork for those who, perhaps, need to be focused on emergency situations in hospital. I am fully behind the new ruling for those living in residential care homes, nursing homes and hospices but am not sure this is money well spent on those in Intensive Care Units and in transportation from one hospital to another. It seems to me that those completing the assessments – such as Section 12 doctors and Best Interest Assessors are in the lucrative situation of charging £250 or so to assess people who are sick in hospital for a week or so. The nursing staff having to make applications, to spend time with the assessors – all of which is time away from using their expertise in keeping the person alive. I am aware that on many occasions, assessors have gone out to complete an assessment and the person has either gained capacity or indeed died or been discharged. I expect the assessors are still paid for their time and yet more public money is swallowed by this over-zealous interpretation of the ruling. Of course, when a patient is resisting treatment and needing restraint, there needs to be protocols in place to ensure it is to maintain the life of the person, but can this not be regulated within ordinary hospital procedures? Public monies are a dwindling resource as services face further cuts. Surely, there needs to be a common sense approach to deprivation and when it is necessary to authorise it. I understand that new guidance is due to be published in 2017 which I hope recognises the paper driven exercise that often seems both pointless and expensive. Yes, all patients should be informed and asked to sign consent for a time when they may not have capacity, following an operation and yes the MCA is a wonderful piece of law that protects the rights of all of us. But, the idea that a person who has suffered perhaps a head injury in a road accident and needs to take an ambulance for numerous hours to a specialist hospital needs a DOLs seems to me to be wasting peoples time and money. I am not sure there is enough emphasis yet on getting this right where it needs more attention, time and money spent. Are there enough home care providers who are involved in supporting a deprivation in a persons own home, not registered, trained in understanding liberty? Do families understand that deprivation of liberty may be seen as false imprisonment? Do enough care homes understand the right for people with capacity to make unwise decisions? Do enough supported living services realise that they may need to apply to the court of protection if they are depriving a person of their liberty? Surely, these are the areas of real concern. And where assessment and monitoring is most needed. I await 2017 publication with much anticipation. Following The Care Act and The Care and Support Statutory Guidance (Oct 2014), it is clear that if we are to understand safeguarding, we must first fully understand The Mental Capacity 2005. I was also pleased to see that the Fundamental Standards thread The MCA throughout and The Care Quality Commission have The MCA at the centre of their inspection process. In 2005, I was thrilled to see the principles of The MCA and truly believed there would be a radical change in practice almost overnight – But it’s 2015 and some services are still failing to uphold the principles fully. Whilst, I understand why it is hard for providers to support an individual in their often ‘unwise’ decision making, and realise it challenges the tradition of care and the instinct for care providers to feel they have the right to stop a person making poor decisions – I find it is a constant revelation in the training room. When I pose the idea that an individual with diabetes may want to eat 12 doughnuts, it is still considered neglect by the service providers to ‘let’ the person do so. I spend much of my time reminding people that they start with The MCA. Does this person have capacity? In line with the first principles of the Act, we must presume capacity unless we have proved otherwise – and our duty of care is to provide information, education, opportunity and choice to said person with capacity, who may continue to eat doughnuts and it is clear that the law protects their rights to do so. The evidence of our information, education, opportunity and choice is vital and of course the risk assessment. In fact, it would be neglect to deny the person the right to make their decision. Of course, if the person does not have capacity then the decision would be made in their best interests. This of course, is where the final principle of the Act takes main stage. Are we using the least restrictive approach? I am not sure it has been challenged enough. My hope is that the ‘new style’ CQC inspections will find a way of monitoring the 5th principle in action. 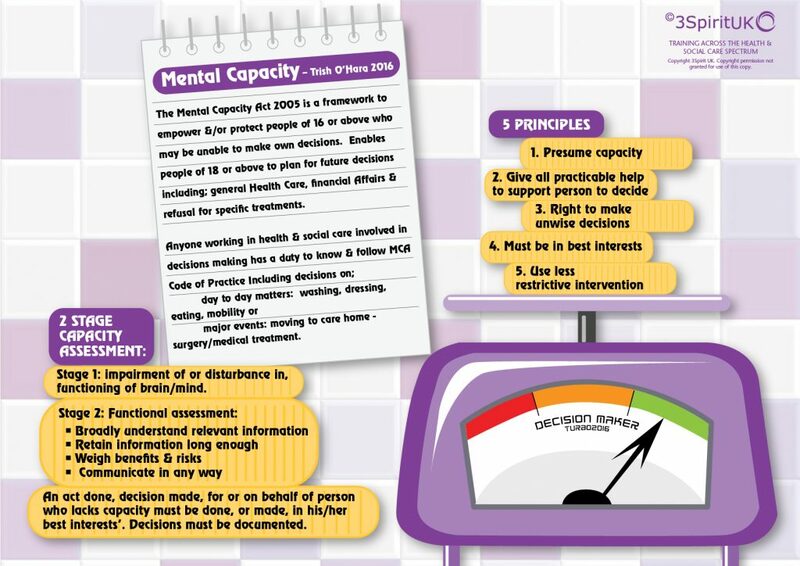 The Mental Capacity Act can clearly be seen in these principles. Starting with empowerment and prevention is a clever way to remind us who is at the centre of any decision and then our proportionate intervention which may need us to protect, if an individual is unable to make the decision – But, when we are protecting, it is essential we understand our responsibility to work in partnership and be accountable for our actions. I love these principles – They make everything so clear. And then ‘self neglect’ as a type of abuse – spoils it. The empowered person, with capacity, makes unwise decisions that may be judged as self-neglect by others. Are we really to see this as an abuse? Is that useful? Especially, as the definition of abuse used in the Statutory Guidance, describes abuse as involving another person or persons. At what point are providers to consider self-neglect as abuse? I can imagine that will be when the individual is making lifestyle choices that the provider does not agree with or like. I am fairly convinced that the contributors who created the principles are not the same group who decided upon the changes to the types. It may have been more useful for us all, if they were. As long as we truly recognise that in order to safeguard, we must uphold and understand The Mental Capacity Act – (DOLs), and we will all be on the right track. Safeguarding is everybody’s business – so is understanding The MCA.